Nicholas Pearce and Will Predhomme form the intermutual Ontario wine agent and sommelier-consultant union extraordinaire. If you’ve not met them, tasted with them or traveled to South Africa with them, you have not yet lived. 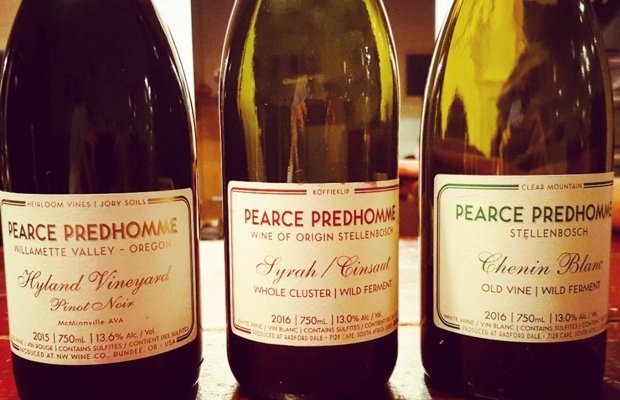 Pearce-Predhomme are the proud papas of wines made in Oregon and South Africa. Their mission is as builders and facilitator-importers of wines from their favourite appellations. Three days ago I tasted their most recent releases. Hyland Vineyard is a rather large 185 acre plot on a south-facing bench in the foothills of the Coast Range near McMinnville in Oregon’s Willamette Valley. 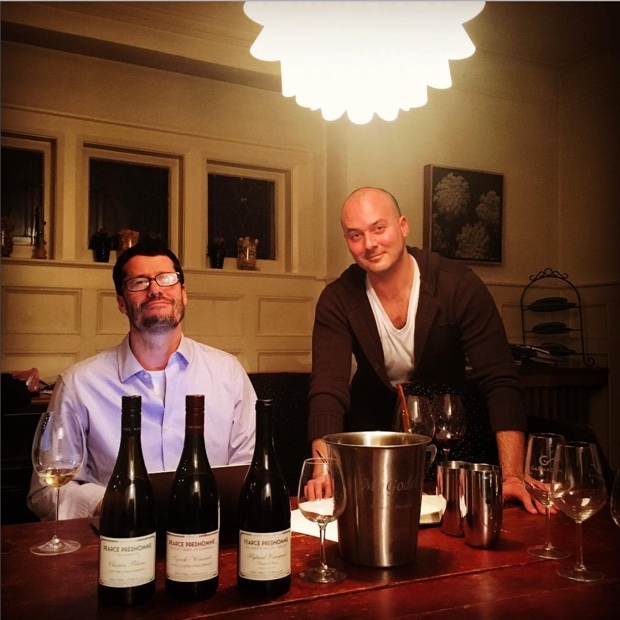 French winemaker Laurent Montalieu makes the pinot noir for Pearce and Predhomme at the Northwest Wine Company. The Helderberg (Afrikaans) or Clear Mountain (English) is the ancient place in South Africa’s Western Cape from which the boys draw their chenin blanc. The bush vines are found in the southwestern-most corner of Stellenbosch adjacent to False Bay. Their first kick at the red blend can is a syrah-cinsault schlepped off of old bush vines on antediluvian Helderberg Koffieklip (ironstone) soils. Both wines are produced in collaboration with winemaker-oenologist Jacques de Klerk and Alex Dale’s Radford Dale brand at The Winery of Good Hope in Stellenbosch. Here are the notes. @mgodello & @willpredhomme getting geeky on the new @pearcepredhomme releases. This entry was posted in McMinnville, Oregon, Pearce-Predomme, South Africa, Stellenbosch, Western Cape, Willamette Valley, WineAlign, Wines of South Africa, Wines Tasted and tagged Alcoholic Beverage Manufacturing, Alex Dale, Bankrupt Vineyard, Beverage Manufacturing, Beverages, Bob Dylan, Chenin Blanc, Cinsault, Clear Mountain, Culture and Lifestyle, Drinks and Beverages, Food and Beverage Sector, Helderberg, Hyland Vineyard, Jacques De Klerk, KoffieKlip, Laurent Montalieu, Nicholas Pearce, Northwest Wine Company, Pinot Noir, Radford Dale, Red Wine, Strook Vineyard, Syrah, Tasting Notes, The Winery of Good Hope, Vineyards and Winemakers, White Wine, Wildcard Vineyard, Will Predhomme, Wine, Winemaking.